It’s been 150 years since the bloodiest war on American soil came to an end, with the final battle staged at Appomattox. Learn how the Civil War wound down and how folks in Galena are celebrating this important milestone. 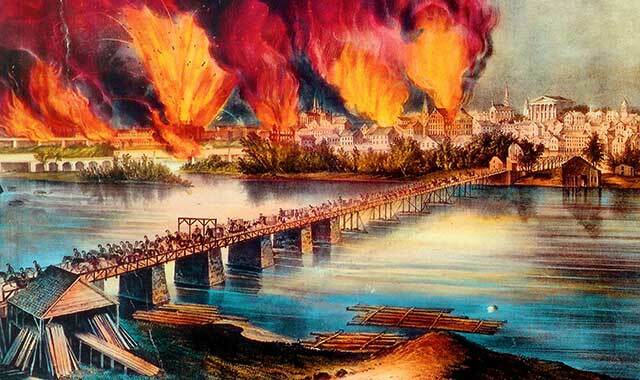 The Currier & Ives lithograph above illustrates the evacuation fire lit by Confederate forces as they fled Richmond, Va., over the James River on April 2, 1865. This year will bring to a close the five-year sesquicentennial commemoration of milestones in America’s deadliest conflict, the Civil War. While we traditionally focus on Gen. Robert E. Lee’s surrender to Gen. U.S. Grant at Appomattox in April of 1865 as marking the end of the war, that event didn’t stop the fighting or resolve all of the issues raised by the struggle. With Grant’s victory in Vicksburg, Miss., in 1863, the Confederacy was cut in half, and Gen. Lee’s defeat at Gettysburg, Pa., in the same week, prevented his invasion of the North to continue. Such good news from the field prompted many Northerners to believe the tide had turned and the war would soon be over. But their spirits plunged early the next year, as Union forces were routed in the Red River campaign in Louisiana, and Grant’s Army of the Potomac piled on staggering losses in his Overland campaign in Virginia. By now, the surviving soldiers in both armies had changed. These were not the same young men who had marched off to war in earlier days, filled with patriotic enthusiasm and looking for adventure. Years of bloody combat, disease-ridden camp life, and the loss of friends and family had robbed them of their innocence and sobered them for what lay ahead. Their officers had also changed, forced to try new tactics of warfare thrust upon them by the repeated failure of Napoleonic methods they all learned at West Point Military Academy. New weapons with increased range and rate of fire now gave defenders a huge advantage over assaulting infantry or cavalry, making traditional frontal assaults suicidal. With no end to the nation’s nightmare in sight, more and more Northerners called for peace talks, for compromise – even for a restoration to pre-war conditions, which included slavery in the South. Lincoln’s new Republican Party split into two factions: the most radical members (“Abolition Now!”) met in May and nominated John C. Fremont as their candidate. The more moderate wing changed its name to the National Union Party and nominated Lincoln in June. Lincoln’s Democratic challenger, former Gen. George B. McClellan, whom Lincoln sacked in 1862 for failing to pursue Lee’s army, was nominated at the convention in Chicago in August. Some say the convention was purposely delayed to give the electorate more time to tire of “Mr. Lincoln’s war.” Peace radicals, called Copperheads, forced the party to adopt a platform calling for “peace on the basis of separation,” but McClellan wanted to win the war. He had to “ride both horses” during the campaign. As it turned out, the 1864 election was decided as much on the battlefield as in the ballot box. Sherman’s Atlanta campaign, begun in May, ended in September with the fall of that Southern city. Admiral “Damn the torpedoes” Farragut defeated a Confederate squadron at Mobile Bay in August, neutralizing that Southern port. And by October, Sheridan’s cavalry had laid waste to the Shenandoah Valley in Virginia, all but eliminating that Rebel resource. Lincoln rode the momentum of these victories to win the election in November, gaining 55.1 percent of the popular vote, the third largest majority in any 1800s election. Also contributing to his triumph was his earlier success at gaining Congressional approval for soldiers to vote in the field. They voted seven to one for Lincoln, choosing to ignore their old general and, instead, pursue the war to a conclusion. Sherman’s army left Atlanta in November on its “March to the Sea,” arriving in Savannah 36 days later, his troops having cut a 25- to 50-mile wide swath of destruction through Georgia. “We are not only fighting hostile armies, but a hostile people, and must make old and young, rich and poor, feel the hard hand of war,” Sherman wrote to another general. In February of 1865, Sherman turned his 60,000-strong army north to invade South Carolina, the “cradle of the rebellion” and the first state to secede from the Union. In a series of flanking maneuvers, his army finally broke through the Rebel lines on April 2, ending the longest siege in U.S. military history. This loss of supply forced Lee to abandon Richmond, the Confederate capitol. Confederate President Jefferson Davis and members of his cabinet fled the burning city the next day, beginning an arduous and twisted journey that ended 38 days later when he and his wife were captured by Union cavalry in Irwinville, Ga. Less than 40 hours after Davis’ hasty departure from Richmond, Lincoln accompanied Grant into the fallen city, and even sat in Davis’ chair in the Capitol. He had been visiting the Union general to talk strategy when the breakthrough occurred. For several days in April, Lee and Grant exchanged messages about the terms for surrender, as each struggled to bring an end to the bloodshed. They finally met on April 9 in the McLean farmhouse near the village of Appomattox Court House in Virginia. Grant’s terms of surrender allowed Confederate officers to keep their sidearms, and soldiers to be paroled and never prosecuted for treason as long as they stayed law-abiding citizens. At Lee’s suggestion, they were also allowed to keep their horses. Grant asked Lee if he was going to surrender all Confederate armies in the field, not just the Army of Northern Virginia, his immediate command. Lee replied that he did not have the authority to do that, and such an act must come from President Davis as head of the Confederate government. But at that point, Davis was nowhere to be found. In a final gesture of respect, Major General Joshua Chamberlain, the Union hero of Little Round Top at Gettysburg, had his subordinate officers salute the Confederate soldiers as they surrendered their arms and battle flags to the victorious Union army. Unfortunately, a bullet from the gun of John Wilkes Booth prevented us from ever fully knowing Lincoln’s plans. The President was assassinated in Washington on April 14, just two days after the four-year anniversary of the attack on Fort Sumter in Charleston Harbor which began the conflagration. Booth was killed two weeks later by Union troops in a barn in northern Virginia where he was hiding. Lincoln’s crepe-draped funeral train took two weeks to travel back to Springfield, Ill., where his body was buried, following the same 1,600-mile route as the train that had taken him from Illinois to the Capitol in 1861 as president-elect. As symbolic as Lee’s surrender was, it did not end the fighting. What it did was precipitate a series of events that gradually brought the war to a close. J.E. Johnston surrendered his Army of Tennessee to Sherman in Hillsboro, N.C., on April 26. The last battle of the war took place on May 13 at Palmito Ranch near Brownsville, Texas. Pvt. John Williams of the 34th Indiana Infantry was fatally wounded in that battle, becoming the war’s final combat casualty. And Gen. Kirby Smith surrendered his Army of Trans-Mississippi at Galveston, Texas, on June 2, the last major Confederate force to do so. The last major event most Union soldiers took part in was the Grand Review, a two-day procession in Washington, D.C., on May 23 and 24, in front of thousands of cheering spectators. Some Illinois regiments balked at the order to wear new uniforms for the parade. They were unwilling to compete with troops from Eastern states, whom they called “feather bed soldiers,” in the area of military neatness and discipline. Instead, several regiments of “Sherman’s mules” packed their new clothes in their blanket rolls, and dressed in the clothing they had worn through the hard fighting in Georgia and the Carolinas. The last shots fired in anger were from the Confederate cruiser Shenandoah, while attacking U.S. whalers in Alaskan waters on June 28, 1865. The ship later surrendered to the HMS Donegal in Liverpool, England, on Nov. 6. On July 4, the first peacetime Independence Day in four years, Brig. Gen. Jo Shelby, refusing to sign an oath of allegiance as a condition of citizenship, crossed the Rio Grande River into Mexico with his troops. It was the largest, but by no means the only, body of troops who deserted their homeland in a concerted flight from U.S. rule. Jefferson Davis had also envisioned escaping to Mexico and trying to raise a Confederate force to renew the struggle, much to the dismay of his closest military advisors, including Gen. Lee. On July 7, four of the eight conspirators in the Lincoln assassination were hanged in Washington, D.C., including Mary Surratt, the female owner of the boardinghouse where the conspirators met to plan their deeds. The others were imprisoned. The 13th amendment to the Constitution abolishing slavery was ratified on Dec. 6. It had been proposed by Congress in January, and Illinois was the first state to ratify it in February. Davis continued to try to justify the South’s right to secession, refusing all the while to sign an oath of allegiance. He died in 1889. In 1978, President Jimmy Carter restored his citizenship posthumously, by signing a joint resolution of Congress, in what some considered a last gesture of reconciliation. Robert E. Lee’s citizenship had been restored in 1975 after someone accidentally discovered Lee’s oath of allegiance, which had been signed by him 100 years earlier, then lost. When the shooting finally stopped, the Union had been restored by a more powerful central government, and slavery was forever banished from the land. But the cost was terrible. Nearly 700,000 people died, including 50,000 civilians, – nearly 3 percent of the U.S. population at the time. About 400,000 soldiers were captured and imprisoned, and 56,000 died in captivity. Almost 185,000 African Americans fought in the Union army; 150,000 of them were former slaves. Billions of dollars were expended; land and resources were laid waste. While slavery perished, racism survived. When the federal occupation of Southern states ended in 1877, Jim Crow laws and terrorism by white supremacist groups combined to deny African Americans their legal rights for another 100 years. What had been paid for in blood would have to be re-won and protected with much sweat and tears in the years to come. Galena had a strong presence in the American Civil War, perhaps out of proportion to the size of this Northwest Illinois community. After residing there less than a year, U.S. Grant left his father’s leather shop to lead the Union armies to ultimate victory. He was one of nine generals to emerge from the town during the war, and at the signing of surrender at Appomattox, three of the dozen Union men in the room were from Galena: Gen. Grant; Brig. Gen. John Rawlins, Grant’s chief of staff; and Lt. Col. Ely Parker, a Seneca Native American and Grant’s military secretary. He transcribed Grant’s surrender terms to Gen. Lee. Special commemorative celebrations of the Civil War were held in Galena on the 50th and 100th anniversaries of the conflict. In 1961, more than 10,000 people witnessed a 90-minute parade which began a six-day historical pageant, including several hundred townspeople, and concluded with a fireworks finale. Galena’s culminating activities to the sesquicentennial commemoration will take place this spring, beginning on April 9, the date of Lee’s surrender. That evening, a dinner theater performance of “Remembering Old Galena” will be presented at the historic DeSoto House Hotel, followed by a concert of Civil War songs performed by Galena’s Bell Choir. At sunset, church bells throughout the city will ring out as they did at the end of the Civil War. the play is based on Toebaas’ research regarding the production of a huge oil painting by well-known editorial cartoonist and artist, Thomas Nast. The 9 X 12 painting, also titled “Peace in Union,” was commissioned by a newspaper man and philanthropist, Herman Kohlsaat, and depicts the surrender event at Appomattox. It was presented to the city of Galena in 1895, and hangs in the Galena & U.S. Grant museum on Bench Street. Toebaas is a long-time volunteer at the museum, and for the past nine years has written scripts for local actors who participate in annual cemetery walks. This is his first play. “I wanted to tell a broader story than just how the painting came about, so I included other Galenians who were part of the Civil War,” says Toebaas. The play begins in London in 1894, with the original meeting of Kohlsaat and Nast, to discuss the possible commission. Another storyline follows the nine generals from Galena, and their roles in the Civil War and after, in Grant’s administration. Battles such as Grant’s siege of Vicksburg, communiques between Grant and Lee before the surrender, and Grant finishing his memoirs are also depicted in the play. Young U.S. and Julia Grant are portrayed by Scott and Peggy Whitney, local retired teachers who run a small farm near Seward. Frequent participants in local parades, historical events and educational presentations, the Whitneys also are featured in a holographic introduction to the Galena & U.S. Grant Museum. The older Grants are portrayed by Bob Buman and Vickie Gratton. Play rehearsals started before Christmas, and include 42 local amateur actors, as well as musicians. The play will be performed in historic Turner Hall on Bench Street four times over the 10-day period. All events are open to the public, but some require admission fees and/or reservations. For more information, see galena.org or visitgalena.org. Tickets for most events can be purchased by calling the Historical Society at (815) 777-9129 or online at galenahistory.org. The Kenosha Civil War Museum, located on the city’s waterfront, is dedicated to telling stories of the Civil War as experienced by people from Indiana, Minnesota, Wisconsin, Iowa, Illinois and Michigan. Its “Fiery Trail” exhibit includes talking mannequins who lead visitors through the war. Central to the exhibit is a 10-minute film projected in 360 degrees, titled “Seeing the Elephant,” a euphemism soldiers used to describe their first experience in combat. The film shows a typical upper Midwest community sending its young men off to war. The film also explores what motivated them, and what they experienced before, during and after a battle. The surrounding images and accompanying sound effects put the viewer in the middle of a battle – very powerfully! This entry was posted on Friday, February 20th, 2015 at 11:59 am	and is filed under Features, Top Posts. You can follow any responses to this entry through the RSS 2.0 feed. Both comments and pings are currently closed.